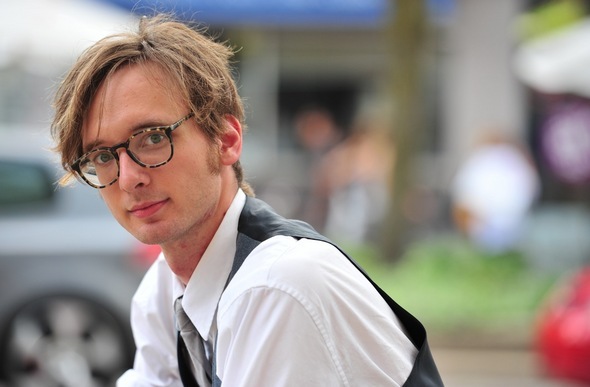 Posted on Thu, Jul 28, 2011 : 5:59 a.m.
26-year-old Connecticut native Zachary Storey is the Violin Monster of downtown Ann Arbor. He's been busking full-time on the streets for about two months and says he's loving the reception he's gotten. 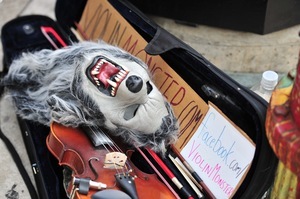 It was earlier this year during a trip to New York when 26-year-old Zachary Storey first threw on a ghastly werewolf mask and took to the streets with his violin. "I started with the mask at the very end of March," he says. "I was visiting my brother in Brooklyn and I had been performing on the street before. And I just kind of wanted to take it to the next level for preparing to go in the subway, because that was another challenge for me." Since that experience, Storey has fiddled his way through other cities. But for the last two months, he's been busking full-time on the streets of Ann Arbor, making a living turning heads and entertaining unsuspecting audiences on Main Street and elsewhere downtown. 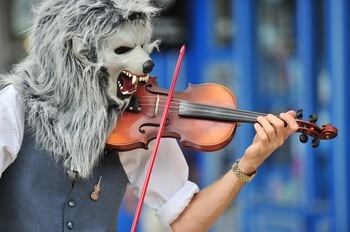 The Violin Monster entertains passersby on Main Street on a recent weekend. He quickly has become an iconic figure in Ann Arbor. "I'm just very grateful for the reception I've had in Ann Arbor. It's been a very welcoming community," Storey says. "I've just really loved it here. I've had people drive by in their cars taking pictures of me here on Main Street. I've had people run up and just take pictures, so people like that as something they can take away and it gives them a laugh." Storey now goes by the name Violin Monster, a persona he created with the help of a mask he found at Fantasy Attic in Ypsilanti. He admits, at first, he almost didn't buy the mask that has helped him achieve street fame. "I spent at least an hour in the store debating whether to get it or not, because it was kind of expensive," he says. "But I'm really glad that I did." A native of Connecticut, Storey developed a love for music at an early age. He says he hounded his parents about wanting to play violin until they caved. "My parents always tell me that, since I was about 3 years old, I kept asking them to play violin," he says. "I guess I was persistent about it, and when I was 6, they got me a violin, found me a teacher, and actually the first teacher that I had, she was really wonderful." Storey started out with fiddle tunes and learned how to read music. From there, he got involved in community orchestras in Danbury, Connecticut. Asked if wearing a mask today helps him overcome stage fright, Storey refers to those earlier years to dispel such a notion. "I've never really had stage fright," he says. "I've been performing since I was 6. My first performance was at this big fiddle festival with thousands of people on blankets all around the stage, so I think that's why I've never had stage fright." The mask came off as the Violin Monster granted a rare interview with AnnArbor.com. At the age of 10, Storey moved to Michigan. Later during his middle school and high school years in Livonia, he spent summers at the Blue Lake Fine Arts Camp, a summer school for the arts located on a 1,300-acre campus in Michigan’s Manistee National Forest. In 2000, he had the privilege of joining the Blue Lake International Youth Symphony Orchestra and touring around the Midwest, as well as Germany and Belgium. But after high school, he moved on to college and he set down his violin. It would be more than seven years before he and his instrument were reunited. "I didn't play at all," he recalls. "I had a lot going on in my life, some turmoil, and a lot of moves back and forth. I actually didn't go to college for music at all." Storey enrolled at Western Connecticut State University, planning to go into a career in elementary education, and that became his focus for the next six years. "At the very end of it, a lot of stuff happened, and I ultimately realized working in a public school would not make me happy," he says. So, after working briefly at a special education school in New York, Storey decided to make a change and he moved back to Livonia. Eventually, he picked up the violin again, he says, "and I instantly just realized how much I had missed it." 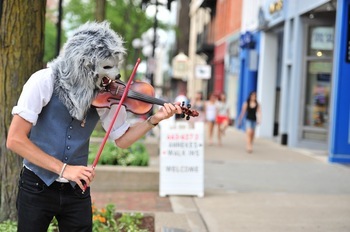 While still living in Livonia, Storey began performing on the streets of downtown Ann Arbor last summer — long before he purchased a werewolf mask. Last August, he registered the domain name ViolinMonster.com, just thinking it sounded catchy, but that was still months before he decided to throw a costume into the mix. He eventually made the move to Ann Arbor in October. And for a while, he made a modest living through a part-time job at a local T-shirt factory. But that got old quick. "When it came down to it, after taxes and everything, I was making right around $200 a week and that was kind of rough," Storey says. "So this music has just become more and more my passion, and I decided to just go for it and stop doing it halfway." It's been about two months now and Storey says he's already making more money busking full-time on the streets than he was making at his last job. He says it's getting him by and he's learning how to do it better and better all the time. "And it's nice to have something that's my own, and that financially — and for my own mental health and emotional health — is so up to me completely," he says. "And that's a liberating feeling to have that much freedom, what I want to do with my life." Storey considers this a starting point. He's building his monster brand through his web site, now complemented by Facebook and Twitter accounts and a YouTube channel. The Violin Monster says he's enjoyed his time in Ann Arbor but he eventually wants to take his show on the road. For those curious, he plays an Otto Ernst Fischer violin. His current set list includes about 30 to 35 pieces ranging from old Irish fiddle tunes to the Beatles' "Yesterday" to staples like "Amazing Grace" and "Ashokan Farewell." He hasn't yet experimented with originals. "What's fun for me to play — and I think I feel connected to — is Irish music, Irish jigs," he says. "A lot of these Irish fiddle tunes are old and people haven't heard them before, so it's new to a lot of people. Also, I'm a quarter Irish and I kind of get in touch with my roots in a way." By the time winter arrives, Storey expects he'll be taking his show on the road to a warmer locale, possibly California. "My goal is to travel around a lot and maybe try to live on the road in a way," he says. "The mask I have now is a werewolf, but what I really want to do is get more and more costumes, and travel around where I can continue to make YouTube videos in each city that I visit." Somewhere in all of this, he hopes, there's inspiration to be found. "I found that with the music, my biggest fans seem to be about 3- or 4-year-olds," he says. "They're just fascinated by it. And every time I see that, I just can't help thinking that maybe I can help inspire a kid at an early age to want to play like I did." Thu, Jul 28, 2011 : 7:50 p.m.
Thu, Jul 28, 2011 : 6:39 p.m.
Thu, Jul 28, 2011 : 2:58 p.m.
We saw him performing at the Art Fair, and my son loved him. He was nice enough to pose for a picture with him, and it reminded me yet again that Ann Arbor can be a pretty fun, whimsical place to live. Thu, Jul 28, 2011 : 1:39 p.m. I first saw him a couple of weeks ago. It was nice to listen to the violin while I waited for the red light on Main St.
Thu, Jul 28, 2011 : 1:23 p.m. Thanks Zach for sharing your music. It's nice to read about somebody who honestly loves his craft. I wish you much success. Thu, Jul 28, 2011 : 12:42 p.m.
That is too tall of an order for the auto-carps. Thanks a lot, Monster! Thu, Jul 28, 2011 : 12:02 p.m.
Thu, Jul 28, 2011 : 11:13 a.m. This is the greatest thing to ever happen to Ann Arbor. Let's have him be the U of M's new mascot. We can build a venue for him to play next to the library. The only thing more iconic than him would be annarbor.com (estab. 2009). Seriously, we need to find a real replacement icon for Jake Woods (Shakey Jake). If nobody around here can fill Jake's saddle shoes, we need to bring someone in who can do the job (Jake hung out at the mall near Saginaw for many years, before getting his big break in the early 1970's). Thu, Jul 28, 2011 : 10:18 a.m.